K9 whirred at his feet and though he had no change of expression – since his metal face didn’t have that sort of mobility - The Doctor was sure he was looking smug. HE never electrocuted his master, that expression was saying. He was almost sure the TARDIS engine hiccupped slightly, almost like an apologetic reply to him. But when he touched it again he wasn’t electrocuted, anyway. He felt fairly sure he could risk asking Wyn and Stella to help him. “What’s up, anyway?” Wyn asked as she took up position at the drive control while The Doctor struggled to make some sense of what was usually called navigation. That implied some kind of decision about the destination and the inputting of co-ordinates by conscious choice. In fact, the TARDIS seemed to be choosing its own destination and refusing to tell him where and when it was. Wyn knew how it was with The Doctor, anyway. So did her mum. Jo had often talked of him promising to take her to some place called Metebelis Three and never making it. In the end she went to Llanfairfach instead and stayed there. The Doctor looked at her and his twinkling eyes dimmed. “Yeah,” he admitted. “It is. And you’re right. That’s about it. Mind you, when they were around, the lazy gits usually left this sort of thing to me. So… well, really, nothing new there.” He smiled and the twinkle came back to his eyes. His moods were as changeable as the weather. Stella wondered if he had been like that in her mum’s day, too, or was it just this version of him. She liked this version of him, anyway. “So what or who is causing this particular bit of continuum vandalism and where and when?” Wyn asked. The Doctor’s smile deepened. She had managed to put all of the questions he wanted answering into one perfectly grammatically correct sentence. He just wished he had some answers to it. He hated not having the answers. A few minutes later they all three picked themselves up from the floor. The Doctor checked the temporal location. “July twentieth, 1969?” Stella glanced at the temporal clock. “Ancient history,” she added cheekily. Stella looked at them both and scowled. She hated it when Wyn and The Doctor got clever together. Stella looked over his shoulder to see if he was reading it from a Wikipedia entry. He wasn’t. She watched him check the time again, noting that it was 09:57 UTC, and then turn on the viewscreen. Apollo Eleven filled the viewscreen for several minutes as its orbit passed the TARDIS. The two humans watched in awe. The Doctor watched in admiration. It was millions of years since his own people discovered space travel. He knew about it only as some really dull history lessons from his early years at the Prydonian Academy before they got onto what he and most of his classmates regarded as the good stuff. It really WAS what Stella had jokingly called ancient history on his planet. By the time he was born there wasn’t much left to discover in terms of space technology. But watching the early efforts of humans to catch up on the universe made him just a little proud of that indomitable race. “How come they never reported seeing a big blue police box out of their windows?” Stella asked. “Er…. You’d better tell THEM that, then,” said Stella pointing to the viewscreen as another space ship came into view. They all looked at the viewscreen and saw that she was right. The ship was not so much flying as tumbling through space out of control. It was a squat looking ship, with a rounded fuselage and odd looking fins that she supposed made it aerodynamic in some way, and two engine nacelles either side, only one of which glowed blue to indicate that it was working. The other was flickering red and a grey and black smoke was pouring from it. “They’re going to hit US,” Stella yelled, wondering why The Doctor was talking about unreliable engines and asteroid belts so casually. The TARDIS engines groaned as The Doctor swung it out of the path of the stricken ship. Everyone felt that tug in the pit of their stomachs that comes with a fast drop. It was the sort of thing that was part of the excitement of a good roller coaster, but part of the hell of dropping through space with a madman at the controls who was grinning and whooping with joy as he used his foot to push a lever his arms weren’t long enough to reach. The alien ship missed them, but by no more than a few inches. Then The Doctor began to shout out more orders to his crew. “What are we doing now?” Stella asked. He didn’t have to explain. It was obvious what was happening. The alien ship was still crashing into the moon, though less terminally than it would have done. But it was dragging the TARDIS with it. The engines groaned again but they all felt the sensation of being towed along, out of control, which was almost as unpleasant as the sudden drop sensation. The Doctor looked like he was playing Twister with the console. BOTH feet reached alternatively to press against levers and his hands reached and pressed and pulled things with desperate fury while he hummed a tune that Wyn couldn’t place for the moment but made her think of football for some reason. It was only later, at a completely irrelevant moment when the tune drifted into her mind again, that she realised it was the theme from The Great Escape. The two sisters looked at the viewscreen and saw the moon getting closer. It already filled the screen and as the seconds went by they saw its topography in increasingly close detail. They knew they were going too fast, and they knew The Doctor was not in control of the landing. Both of those facts were frightening. Travelling in time and space in a blue box were only fun as long as they knew the owner of the box was in control of it. Everything else was a near death experience. They landed hard. Everyone was thrown to the floor again. How many times was that today? The Doctor was the first to scramble to his feet, and he gallantly helped his companions up and reached for his sonic screwdriver in tissue repair mode to mend a nasty bump on Stella’s forehead sustained as she had banged against the console. “Ooh,” Stella sighed. “That feels nice. Like being massaged with something cool and soothing. It’s almost worth getting hurt.” The Doctor smiled warmly at her and turned to Wyn. “Any thing I can help you with?” he asked, waving the sonic screwdriver. The Doctor kicked the console and the lights stopped flickering, but they were dimmer than usual. Wyn automatically reached for the first aid kit that was kept in a panel under the console. Stella stepped towards the door. “Suit up?” Stella looked at The Doctor’s retreating back as he went through the inner door. She and Wyn followed him until he stopped at a door next to the kitchen that they always assumed was a broom cupboard. Wyn wondered WHY they thought that since the TARDIS automatically dispelled dust through its vents and nobody EVER swept the floors. In fact the cupboard contained space suits. She supposed that made sense. This was a space ship. There must, occasionally, be a need for space suits. He handed out the suits and showed them how to put them on properly and attach the helmet and oxygen tanks. “We’re space women,” Stella laughed excitedly. She tried to jig up and down but found that her feet were clamped to the ground. They all adjusted their gravity and stepped back into the console room. They noticed The Doctor do something at the console before he turned towards the door. Wyn was on the point of asking when he supplied the answer to the question. “? ?” said Stella’s face. Her voice couldn’t work out how to form the question. “My room is flat packed?” Stella looked worried. But The Doctor opened the main door and she forgot all about it as she glimpsed the moon surface. 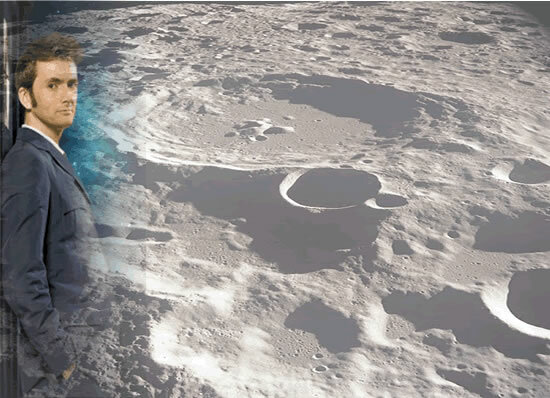 A moon surface that had not been stepped on by any Human being – yet. She turned up the gravity control and stepped onto the surface. She made three or four more steps and turned and looked at The Doctor and Wyn as they followed. Behind the helmet visor she was grinning with excitement and delight. “I was the FIRST!” she cried out shrilly. Wyn and The Doctor both winced as her voice came through the microphone headsets that they communicated through and told her to turn it down just a bit. “So where ARE we?” Stella asked, a little slow on the uptake. “In six hours, thirty minutes and fifteen seconds,” K9 said. “We really want to avoid that, then,” Wyn observed. “Anyway,” The Doctor added. “Errand of mercy, first.” He looked carefully at the crashed spacecraft. It was more or less intact, although it had landed at an angle and one of the fins was buried in the thick grey moondust and the other one had a bad crack along it. He stepped up to the airlock door and ran his gauntleted hand down the edge. Even through the fabric he could sense the atmosphere inside. It was oxygen based, though thinner than Wyn or Stella were used to. It would feel like they were at high altitude. But they should be ok. They weren’t going to be there for long. That was a very good point, The Doctor conceded to himself, but he carried on unlocking the door. Apart from anything else, it was his duty to offer assistance to the occupants of the crashed ship. There was an intergalactic law that no ship’s captain with a conscience could disregard. The Captain of the good ship TARDIS had an abundance of conscience. He sometimes thought he was the conscience of the universe. The airlock door opened with a hiss. They stepped inside. The Doctor closed the outer door and pressed the button that re-pressurised the small, claustrophobic room before they could open the inner door. The Doctor thought about what Wyn had said and thought about some of the hostile races that existed in the universe and changed the setting of the sonic screwdriver to welding mode. He had never actually used it to weld an enemy, and the confirmed pacifist soul of him hoped he never would. But just in case…. The first thing they heard as they stepped in through the inner door was what sounded like either a baby or a kitten crying. It was hard to tell which, but they all understood it was the sound of something or someone very vulnerable in distress. “This is a small freight ship,” The Doctor observed as he took off his helmet and looked around. Stella and Wyn did the same as they picked their way through a small cargo hold. A lot of the cargo had broken free of the straps that held it in place. The impact had been hard enough to do that. That made The Doctor anxious about the crew. He thought he’d managed to give them a soft landing. But it looked like it wasn’t soft enough. “What sort of cargo is this?” Wyn asked as she moved a box out of her way and it split open, spilling a pile of toys out of it. Mostly they were balls of various sizes and colours and they all rolled away into the shadowy corners of the dark hull. “Looks like somebody moving house,” Stella commented. He took the lead as he stepped through the bulkhead door. Wyn and Stella followed curiously and were very surprised by the next sounds The Doctor made. “Kitty?” Stella and Wyn both chorused and then gulped as The Doctor turned around to reveal the small child he was holding. It had the shape of a Human aged about three, but it had the face, paws and tail of a cat and the parts of it not covered in a blue romper suit had fur. The Doctor was cuddling it tenderly and it was making much quieter noises now, though its three siblings in the big basket were still crying. The Doctor listened and realised she was right. He put the child/kitten in Stella’s arms. Wyn followed him as he sprinted to the bulkhead door opposite where they had come in to the untidy living area. On a ship as small as this the last section had to be the cockpit. The door was jammed. It wasn’t locked. But it had jammed on impact. The Doctor tested first to make sure there WAS atmosphere behind the door and then used the welding mode of the sonic screwdriver to cut through the hinges and pull the door aside. The cockpit had suffered the worst of the damage. But after glancing at the exoglass ‘windscreen’ to ensure it was intact and not leaking atmosphere or in any imminent danger of doing so he gave his attention immediately to the two people he found there. Both the people were CATS, Wyn immediately noticed. Again their height and body shape was roughly that of Human adults, but they had cat faces and paws and the female had a slit in her dress to allow a long black tail to hang out. She was kneeling next to a male who was trapped beneath a spar of metal from the wrecked drive controls. “The children are fine. They’ve got a babysitter now.” He touched her on the shoulder and pointed back through the door to where Stella was sitting on the floor feeding cream to all four of the children, two of them lapping from bowls on the floor, and two climbing all over her to drink from a bowl she held in her hand. “Let’s see what we can do for Gordo,” The Doctor added. He had already drawn his sonic screwdriver and changed the setting to medical analysis. Gordo was not doing too good. His lifesigns were weak. A concussion to the head was the reason he was unconscious, but there was also massive internal bleeding. The Doctor put his hand on the spar that trapped the cat-father thoughtfully. “Operate?” Wyn and Petra both looked at The Doctor equally fearfully. Wyn knew The Doctor could literally BE a doctor when he had to be. But this sounded desperate even for him. Wyn did as he asked. He turned to Petra and put his hand on her shoulder. “I’ll be back as fast as I can,” he promised. Petra looked into his brown eyes and knew he was telling the truth. She nodded and managed a smile. He ran back through the living cabin, telling Stella she was doing a great job, and through the cargo hold where the entire possessions of the McDevitt family were stored and into the airlock. 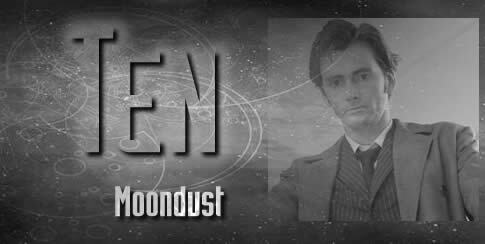 It seemed to take a precious long time before the outer airlock opened and he ran out, his footprints once again marring the pristine grey-white moon dust as he raced across the fifty yards or so to the TARDIS. He was inside the door before he remembered he hadn’t put his helmet back on. He was so anxious to get there he hadn’t even thought about breathing. He breathed now, one deep breath and then reached the console. He restored the internal rooms. That took a few minutes before the inner door would open and he raced down the corridor to the medical room. He wondered why it was that such an important room was so far from the console room. It stood to reason that if it was needed it was probably needed in a hurry. But the TARDIS had been designed to have the kitchen, bathroom, bedrooms, waste disposal, even a home cinema room that Wyn and Stella used on long trips, all much closer than the medical room. The Doctor knew perfectly well that the TARDIS could re-arrange all the rooms at will. It COULD put the medical centre next door to the console room. He could only conclude that the reason it didn’t was that it like to make him run. It liked a bit of drama, and having him race through the corridors on a life or death mission where every second counted was drama. Daytime TV drama, he noted wryly. He never figured the TARDIS for a soap fan! He reached the medical room and quickly grabbed everything he would need. Scalpels, sutures, swabs, sterile gloves, face masks, paper surgical gown, anaesthetic, oxygen…. His head buzzed with the list of thing he needed and by the time he was finished he looked like a contestant in one of those game shows where you had to hold onto all the prizes and not drop them. He was halfway back to the console room when he remembered that he had left his helmet behind. Least of my worries, he murmured as he burst through the door and ran across the console room floor. 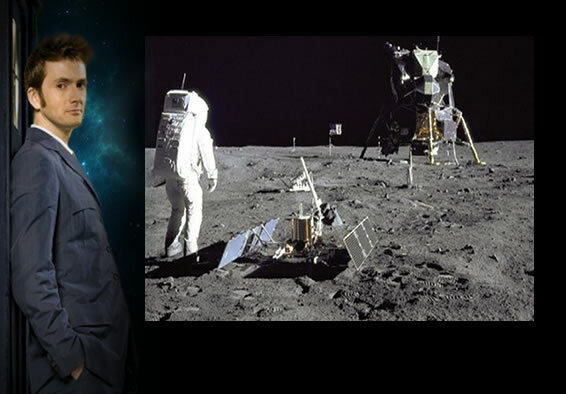 He raised his foot up agilely to the manual door release and stepped out onto the moon again. As he ran he noted Apollo eleven passing by in one of its final preparatory orbits before the landing. Time was NOT on the side of this Time Lord right now. Again, the airlock seemed to take ages before it let him through. It wasn’t an excessive time, really. His internal body clock knew that. But his anxious hearts and mind felt just like any other being who feels the pressure. Every second he was delayed was a second more in which Gordo McDevitt got a little weaker and less able to survive the terrible stress on his body when he lifted the spar and began to operate on him. He put on the surgical gown, gloves and mask first and had Wyn and Petra do the same. Then he took the sonic screwdriver in that welding mode he hoped never to use as a weapon and carefully welded through the spar. Wyn and Petra took the strain of it and as soon as it was broken free they lifted it and pushed it aside. Immediately, The Doctor got into position and Wyn took her place as his head nurse, placing a mask over Gordo’s face, supplying a mixture of oxygen and anaesthetic. “Turn the pressure down,” he told her. “They come from a planet with a lower oxygen content in the air. The usual pressure will be too much for him.” Wyn did as he told her as he made the first incision into Gordo’s torso. Beneath the soft brown fur on her face Petra blanched as a lot of blood poured out of the incision. “That’s because his stomach cavity is full of blood,” The Doctor said as he asked her to apply the sterile swab. She did so obediently and The Doctor opened up the incision more fully to see where the damage was. His disarming grin was lost behind the face mask, but Wyn saw that his eyes had that twinkle that proved he really wasn’t just saying that. He could perform the operation, even if they were doing it in a cramped little cockpit of a tiny family space ship. Things would be all right. Petra didn’t know about the twinkle. She was still anxious. The Doctor knew that. As he worked steadily he talked to her. “You’re moving house then?” he asked casually, as if they were just having coffee at a space station lay-by. Gantus III was, he knew, the old name for the planet Humans eventually renamed New Earth. Felinites had been the indigenous population when the Humans arrived and established their version of civilisation on it, much like Cortez established civilisation in the Americas and Europeans had established civilisation in Australia - or his own people had established civilisation on a variety of planets in shouting distance of the Kasterborous system. At the expense of the customs and traditions of those who thought they already were a civilisation! But that was a long way in the future. Gantus III was at this time a small colony of Felinites who set out from their own overcrowded planet where, as Petra said, it was impossible to find a bit of land to bring up a family that wasn’t already claimed as somebody else’s territory. Gantus was their equivalent of the open American prairies to the pioneers of the late nineteenth century on Earth or the Beta Delta colonies to Earth humans by the twenty-fourth century. It was the land of opportunity for those prepared to brave the hardships and trials and make a go of it. What puzzled him was that Gantus III was about five hundred light years away from Earth’s solar system. This little ship could not possibly have drifted this far off course on its own. He gave his full attention to Gordo for a few minutes as he reached the crucial part of the splenectomy where he actually cut out the organ and micro-sutured the left and right gastro-omental arteries. Humanoids could live without the spleen. It made them very susceptible to infection. Gordo would have to be careful to get all his vaccinations up to date and get the regular parvo-virus and feline flu jabs. But he should be ok.
“His blood pressure is down a bit,” Wyn observed as The Doctor began to suture the wide incision he had made into the body cavity. The Doctor looked up and noticed she was right. “He needs a blood transfusion,” he said. He looked at Petra. She shook her head. Felinites had completely different blood groups to other humanoids, The Doctor remembered. There was no way the children could give blood at their age. Only one thing for it. He told Wyn to take over the suturing. It was fairly straight forward now and began to set up a simple gravity transfusion, taping the needle at one end of the tube into Gordo’s vein before rolling up his own sleeve and inserting the other end into his upper arm. Petra looked startled. “Are you ok doing that?” Wyn asked. He was not exactly stocky of build and his arm looked thin and pale even before he began syphoning off his own blood. By Human standards he looked anaemic already. But of course he wasn’t Human, and as she completed the operation on Gordo McDevitt he gave up two pints of his own blood to ensure their effort was not in vain. He didn’t even look dizzy when he was done, although he did ask Petra if there was any chance of a cup of tea. Wyn wasn’t sure if he really NEEDED a cup of tea or whether that was just a way of getting Petra to do something other than worry about Gordo for the time being. By the time Petra had made the tea in the corner of the living area where she prepared the family meals, The Doctor had carried Gordo gently through and laid him in the bed where the two adults slept. He just needed rest now. The Time Lord blood mingling with his own would give him the boost he needed until his own body was ready to do the fighting for him. The Doctor took the tea and drank it. He knew they were still on a time limit, but even he needed a breather before he tackled that next problem. He looked at Petra as she cuddled her children, competing somewhat with Stella for their affections. A Time Ribbon, The Doctor thought. They were rare things. Even his own people weren’t sure what they were and they were so erratic there was no way to study them. But when they occurred they caused tragic devastation. Gordo and family had been in the wrong place at the wrong time. “Sure, Doctor,” Wyn said, uncurling herself from the cushion she was sitting on. Cushions were what Felinites used for chairs. It made sense, but it meant you had to stretch your legs after you stood up. K9 declared himself ready for action and hovered along at The Doctor’s ankles as he came back into the thoroughly battered cockpit. Blackened patches where small fires had died out in the oxygen light atmosphere showed which instrument panels were most seriously damaged. Even the most cursory visual assessment was dismaying. When he set K9 to do a diagnostic test of the computerised navigation system his hearts sank. It would have taken many MORE hours, Wyn reflected, if any ordinary computer engineer was in charge of the repairs. She was a pretty good one herself, but she wouldn’t know where to begin. She did what The Doctor told her inside the panels while his hands blurred as he worked. Petra brought more tea, but this time The Doctor let it go cold. He was too busy. Wyn saw his expression as the time passed by. He was worried. Desperately worried. He might not do it! The idea shocked Wyn. The Doctor not able to do something was a new and curious, and dreadful thought. He could do anything. He could do everything. He always had the answer and he always saved everyone in the nick of time. She had been there at the nick of time, the last moment, the eleventh hour, more times than she could count. The Doctor always managed to cut the blue wire and stop the bomb going off. Or if she was going to do movie metaphors, he was the US cavalry coming over the ridge as the civilians in the circle of wagons were down to their last bullets. He ALWAYS did it in the nick of time. Not this time, Wyn, The Doctor thought. This time I can’t. There’s too much damage. Even if I get the systems on line there’s still…. He groaned out loud and his hearts sank even further. The wings. He still had to look at them yet. “I KNOW you’ll think of something,” she said. She smiled at him. He smiled back, but with his mouth. Not with his eyes. The twinkle wasn’t there. He forgot, again, that he didn’t have his helmet. He could have borrowed Wyn’s or Stella’s, of course. But he didn’t even think about it until he was in the airlock waiting for the depressurisation. He closed off his lungs. He could keep going for about thirty minutes without needing a breath. If he couldn’t do it in that time he couldn’t do it at all. He looked up. Last minute preparations were going on up there. The lunar-lander was being prepared for that historic happenstance that was only about an hour away now. Of course, when they did land it was another few hours before they judged it the right moment to step outside, but the Eagle had WINDOWS. They couldn’t be here then. It seemed trivial. What would it matter, some might say, if Neil Armstrong popped along and had a cup of tea in the TARDIS and said hello to a race of people who evolved from panthers and not apes? BECAUSE it didn’t happen, was the reason. Humans couldn’t find out, today, July twentieth, 1969, that there really WAS life on other planets. They couldn’t know that their technology was thousands of years behind even the Felinites, who still used a relatively primitive method of propulsion in their little immigrant crafts. Time Lord technology would send them mental. It had to happen in the right order in the right time frame. Humans needed another three centuries of slowly developing technology before they could “slip the surly bonds of Earth” at will and go on to slip the even more surly bonds of the solar system and reach out to touch all those stars in their heaven, even if they never managed to touch the face of their god. Enough poetry, he chastised himself as he tested the right forward fin and a chunk of it broke off in his hand. He sighed dismally. The Time Ribbon had been almost wide enough for the ship to pass through whole. The Doctor didn’t like to think about what would have happened if it hadn’t been, but the vision came unbidden into his mind. One half of the ship would have been left in the original space time location, and the other would be instantly transported to this one. The children, Gordo, Petra, would asphyxiate as their poor bodies tumbled out into the vacuum of space. He shook himself and pushed the horrible thought away. It hadn’t happened. But the fin must have dragged the edge of the Ribbon and the temporal equivalent of sparks had flown. Where they hit bits of the fin had been split off and left randomly in space and time. What was left looked like it a Spitfire wing that had been shot up by a Messerschmitt. There was no on the spot bodge job he could POSSIBLY do that would make this ship spaceworthy in the twenty minutes margin he had before the perception filter failed and the TARDIS and the Felinite ship were both visible to Apollo Eleven and the world. The perception filter! The Doctor turned and ran to the TARDIS. When he came out through the console room loaded with medical equipment he hadn’t closed the inner rooms down again. He hadn’t had a hand free to do it and he had been more concerned with getting back to Gordo. The back up system was ten minutes short of going down. There was an insistent alarm telling him so as he entered the TARDIS. He looked at the console. The mains engine would be ready to come back online in about fifteen minutes. There would be five minutes when they were all completely exposed. An insane idea occurred to him. A long shot even longer than offering a lorry load of chewy sweets to a bus depot eating giant lizard. He ran through the inner corridors to a room loosely called the lumber room. It was where he chucked all sorts of bits and pieces that got left behind on the TARDIS. Odd bits of furniture that he accidentally materialised around from time to time; a spare hatstand, a portaloo - don’t ask; half a Dalek. REALLY, don’t ask. Anything, basically, that wasn’t a weapon. Those he threw straight in the garbage disposal. This wasn’t technically a weapon, so he had tossed it in here and almost forgot about it. But right now he could think of a really good use for it. He turned and ran back through the console room, taking a gulp of breath before he stepped out on the moon again, wryly noting that there was a whole trail of footsteps in the dust now. Virgin territory it was not! He stood a few feet away from the Felinite craft and raised the shrink ray that had been confiscated from one of B’Tallia Vance’s henchmen the last time he ran into her/him. He fired a burst and watched as the craft shrank to the size of a child’s tricycle and picked it up and tucked it under his arm as he turned back to the TARDIS. He stepped inside and closed the door. He put the ship down on the floor gently and stepped towards the console. It was actually quite easy to do the same thing to the TARDIS itself without a raygun. He didn’t do it often, not deliberately anyway. But he could if it was convenient to do so. He did so. Inside there was no obvious difference. Outside, if there was anyone to observe, the TARDIS would have been shrinking down to the size of a child’s dolls house. He heard a soft plump and knew that some of the moon dust had collapsed onto the roof. That ought to be enough to disguise the ten inches or so of blue roof as he turned off the perception filter. Without it the back up power would last the ten minutes until the mains engine could fire up again. He reached in his pocket and called Wyn on his mobile. “Are you ok in there?” he asked, just slightly worried about the wisdom of shrinking down a ship full of people and then shrinking down the ship that ship was in. He was slightly relieved when her voice didn’t sound at all ‘small’. Wyn sounded puzzled but said she’d make sure everyone did as he said. He asked about Gordo and was told that he was snoring, which had to be a good sign. And Stella was becoming seriously emotionally attached to the kittens. He felt the slight shudder as the main engine finally kicked in. He smiled and reached to reverse the miniaturisation process and made the TARDIS full size again. Yet again there was no difference inside, and outside the perception filter was in place again so any observer would only have noticed a square indentation appear in the moondust. Those indentations and footprints were something The Doctor had to deal with next before he could think about leaving. He very carefully piloted the TARDIS upwards about ten feet, then turned a dial that turned the underside of it into a powerful gravitational force. Moondust rose up like iron filings attracted to a magnet that was then abruptly switched off. The dust fell again and settled smoothly and there was no trace of any footprint or indentation ever sullying the Sea of Tranquility. He looked it over carefully before he was satisfied then hit the dematerialisation switch minutes before the lunar lander descended and history was made in the proper order history was supposed to be made in. Wyn and Stella, accompanied by the children and Petra stepped out into the sunshine. “Where are we?” Wyn asked as she looked back at the Felinite ship parked on a rather nice golden beach. The Doctor was standing there with a smile on his face and his hand behind his back, holding something he didn’t want her to see. Petra was happy to leave the children in Stella’s care on the beach – they were happy with the sand but stayed well away from the sea. A race dislike of water, of course. She went with The Doctor and sat beside Gordo as he slept on, unaware of being moved into the nice comfortable bed in the medical room. Neither he nor Petra were aware of The Doctor going back outside and firing the raygun at the ship and shrinking it back to tricycle size. Wyn watched him do that and remembered what he had said about not looking out of the windows and put two and two and two together and then divided them. “Oh!” she said. “Right. I see.” She took a tuna fish sandwich and stretched out on a towel in the sunshine, glad to be rid of the space suit. She just nodded when The Doctor picked up the toy sized ship and left it inside the TARDIS before coming to sit down himself. It would only take a few hours to get to Gantus III and drop the family off. They could enjoy their picnic first. When they left, the tide would handily wash away the footprints and sandcastles and impressions left by two alien craft that had briefly visited. “It’s still July Twentieth, 1969?” Wyn asked out of idle interest as she looked up into the blue sky. Despite it being mid-afternoon there was a faint, pale gibbous moon in the sky, as there so often was when moonrise didn’t coincide with night-time. She couldn’t see anything, of course. But she had imagination enough to picture what was going on up there. “Yes,” The Doctor said. He reached out his hand towards that pale moon and waved, and in a low voice recited the poem that had been in his head for a while and which seemed wonderfully appropriate for this momentous day in Earth’s destiny.